This soup is a classic throughout Mexico. Traditionally, stale corn tortillas are cut into thin strips, fried in oil, and then used to thicken a tomato-enriched broth. 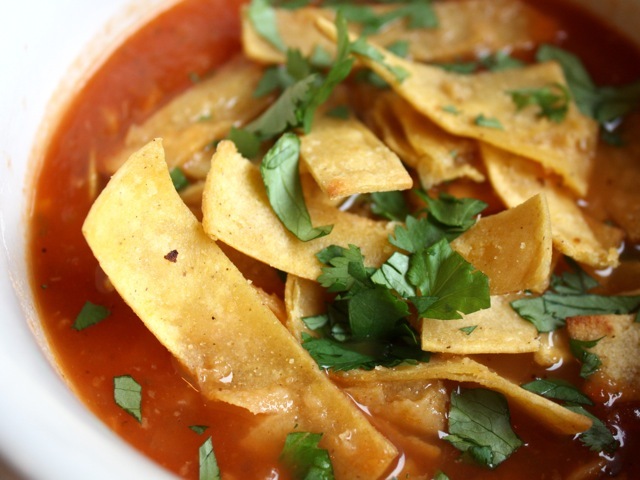 I use "oven-fried" corn tortilla strips, which are lighter and less messy to prepare. To make this soup especially hearty, I have added more onions and tomatoes than is customary in Mexico. Move an oven rack to the middle position and heat the oven to 425 degrees. Place the tortillas on a rimmed baking sheet. Brush both sides of the tortillas with 1 tablespoon of the oil. Bake until lightly crisped, about 6 minutes. (Don't let the tortillas become overly crisp and stiff, or they will shatter when you try to cut them into strips.) Cool the tortillas slightly and then use scissors to cut them into ½-inch wide strips. Set the strips aside. Meanwhile, heat the remaining 2 tablespoons oil in a large saucepan over medium heat until shimmering. Add the onion and cook until golden, about 5 minutes. Stir in the garlic and chile and cook until softened, about 1 minute. Add the tomatoes and broth, raise the heat to high, and bring to a boil. Stir in the tortilla strips and cilantro and cover the pan. Remove the pan from the heat and set aside until the tortillas soften and start to lose their shape, about 5 minutes. Adjust the seasonings, adding salt to taste. Ladle the soup into bowls and serve, passing the lime wedges at the table. Culinate editor's notes: It's easier to oil the tortillas and cut them into slices before baking them. If you want to skip the oil entirely, snip the tortillas into strips and brown them a bit in a nonstick or cast-iron skillet for a few minutes before adding them to the soup. Add a bit of ground cumin and dried oregano or epazote to the garlic and onion as they're sautéing. Purée the finished soup with a handblender, blender, or food processor. Make this soup heartier by serving it with chunks of avocado and queso fresco; toasted pumpkin seeds and cubed roasted butternut squash are also delicious add-ins. For a light meal, serve with Butter Lettuce and Spinach with Citrus and Avocado.